I don’t attend too many weddings. Maybe I don’t know enough people. Or maybe I’m at an age when most of my friends and I guess family too, are either married or not old enough yet to tie the knot. No matter how good, or bad, the wedding is, it is nice to attend them. So many people lead very busy lives, with little free or unprogrammed time in the schedule. Children go to school, activities, camp or play with friends. 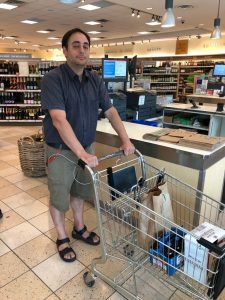 As adults, we spend much of our time working, cooking, cleaning, shopping or if we have kids, chauffeuring them too. Sometimes it seems that one day just flows into the next, with a hectic schedule from dawn to dusk. I will admit that I don’t put aside nearly enough time for myself, to relax or do stuff that I love. And I mean stuff for me and only me. My recent trip to Scotland was definitely for me (ya I guess David too), and it gave me the chance to recharge my battery. But I will say that I definitely make time for family and for family celebrations, like a wedding. 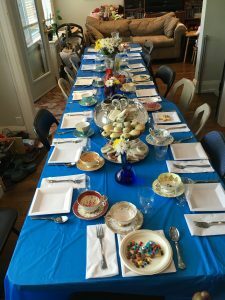 In the hustle and bustle of our busy lives, we often turn down invitations to celebrations or events because it’s too expensive to attend, too hard to travel or we just don’t have time. We say, “Oh I can’t come this time but I will try to make it next time.” And we continue on with our busy day. We see the photos and hear the stories and we think wistfully of the next event, when we will attend. David and I try to attend as many family celebrations as we can. I will admit that we can’t make it to everything, but we try our best. 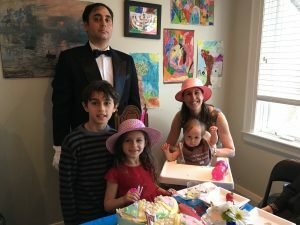 With family and friends who live all over the world, and with our love of travel, we have participated in a fair number of Bar and Bat Mitzvahs, milestone birthdays and weddings. It can be a financial strain sometimes and the timing can be a challenge, but really, it’s worth it. 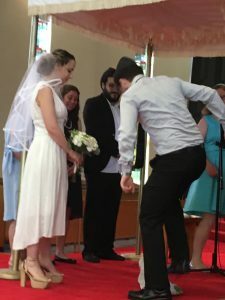 On Monday we celebrated the wedding of our nephew, Joseph, to his wonderful new wife, Hadas. 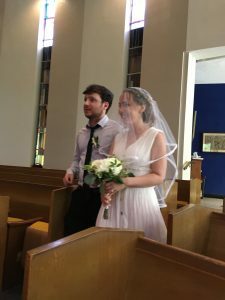 I will not do a rundown of all the details of the day, from the elegant but simple flowers to the dinner’s main course (oh my gosh they served roast beef and it was cooked perfectly!). If anyone wants a full detailed analysis, you know how to find me. 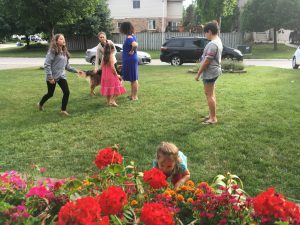 It was a small, intimate wedding, with family and a number of their close friends. David’s sister, Linda, lives in London, Ontario, and we traveled the easy two hours down the highway on Sunday afternoon to join the festivities. 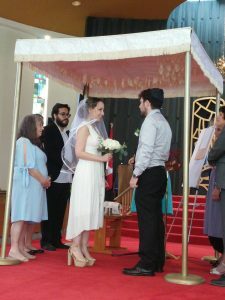 A wedding is not just the short ceremony and party. It also includes the days leading up to the big event, day before, day-of activities and even breakfast the next day. It’s a bit of a package deal, if you want to get the full benefit. 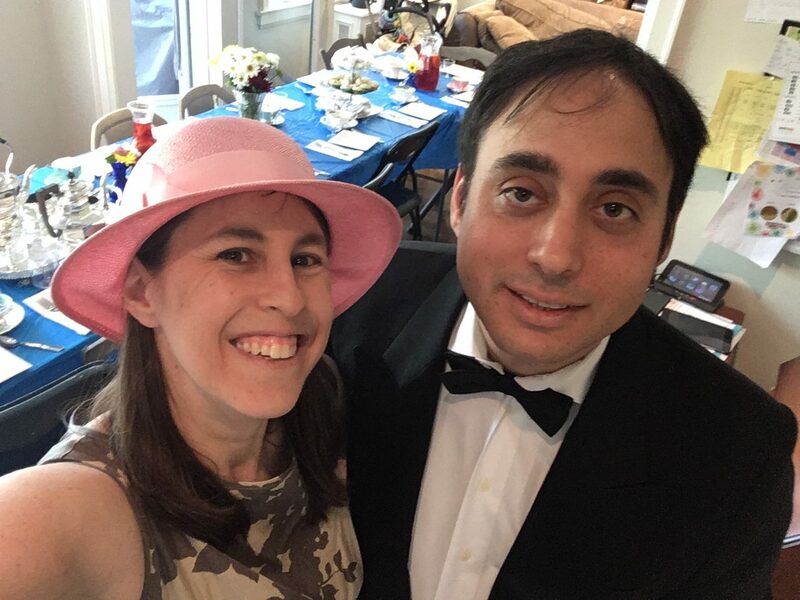 Sometimes the best part of a wedding can be a BBQ in the backyard the night before or running around the following morning to the liquor store to secure the right kosher liqueurs! Last minute liquor purchase, phew. 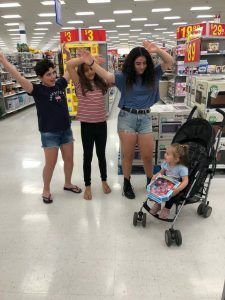 Nessa enjoyed some entertainment from her cousins before the wedding, at Walmart, of course. The faces of the bride and groom as they walk down the aisle or how they look at each other during the ceremony are special moments. And will he break the glass on his first try? 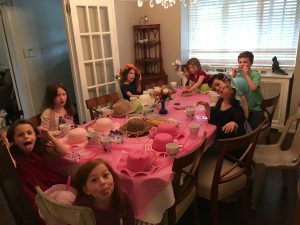 Family photos – who won’t smile and who will blink when the camera flashes? 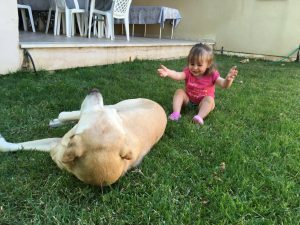 Which child will throw a tantrum? What was the best appetizer passed around during cocktails? 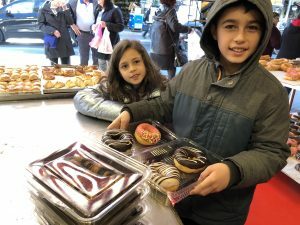 Which dessert was the tastiest? They kept eye contact for much of the ceremony. He got it the first try. 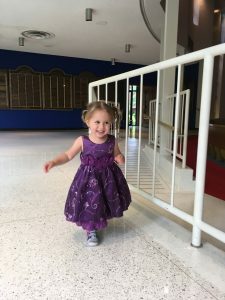 She didn’t sit still and had a wonderful time. You have to be there to experience it. I know it’s not always so easy and I’m so glad every time we make the effort. A wedding is fun and it creates such wonderful memories for not only the bride and groom but for all the guests. We have another family wedding, for a cousin, in a few weeks, so who’s next? Israel is a long way from Toronto. If you fly direct, the flight takes about 12 hours. We travel this distance as often as we can to visit with our extended family. 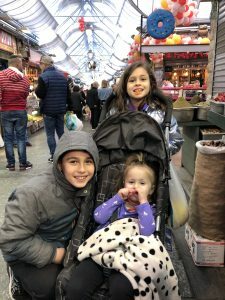 While there are so many wonderful things to do, places to visit and food to eat in Israel, the main reason we come is to see brothers, sisters, nieces, nephews, cousins and friends. I often joke that it’s my 12-hour flight to Montreal. And it’s worth it. 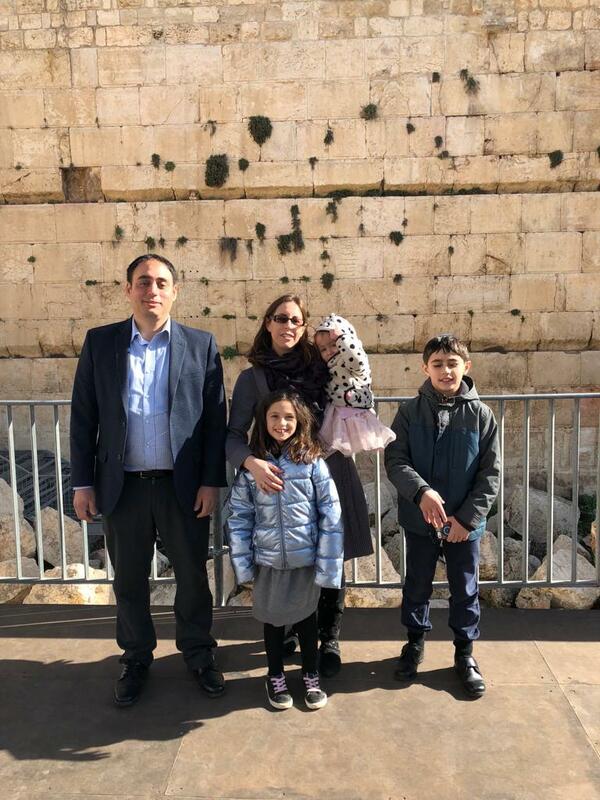 David and I both have extended family in Israel. 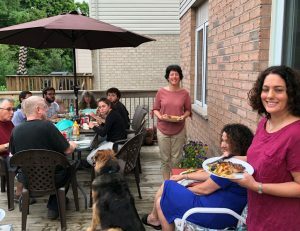 Most of the family we visit with are David’s relatives, including his mother, sister and brother, but I have a few cousins too. We see these people once, maybe twice each year, and we savour every moment that we are with them. I will admit that concentrated time with family can be a bit stressful for all, and tempers get heated sometimes. Okay, often. Yes, there are blow-ups. But isn’t that normal when extended family come together and live under one roof for any period of time? We just enjoyed a wonderful few days in the desert with David’s extended family. 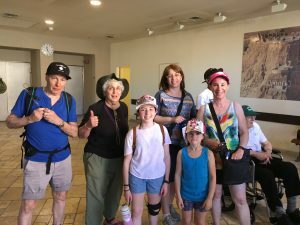 His mother, Barbara, generously treated us to the field school experience in Ein Gedi, which we all enjoyed. It gave us an opportunity to be together and recharge our batteries in the most relaxing of settings. 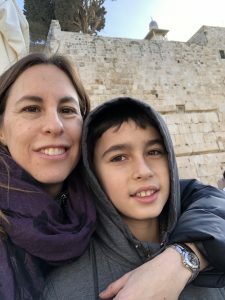 A night hike in the desert, a trek to a waterfall, a visit to the ancient fortress of Masada and a swim in the Dead Sea were all done with extended family. We relaxed outside under a full moon in the evening and caught up with old friends. What a way to spend a vacation inside a vacation. 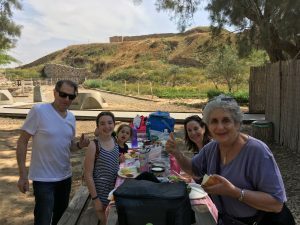 After we left Ein Gedi some of us traveled north, first through the desert, then through the heart of Israel and into the Galilee, to see my extended family. 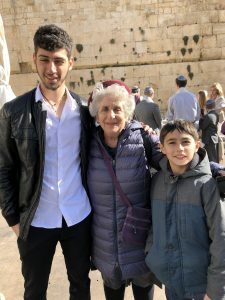 I have relatives in Israel who I only met in the last ten years. Over 100 years ago my great-grandfather traveled to Canada from Ukraine. Not all of his siblings joined him, and one brother stayed behind and eventually moved to Argentina. The family stayed in touch for a while but eventually, over the years, were separated. 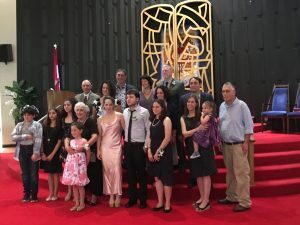 My great grandfather’s descendants stayed in Canada, and some my great-grandfather’s brother’s descendants stayed in Argentina while others moved to Israel. To make a long story short, about a decade ago we found each other. 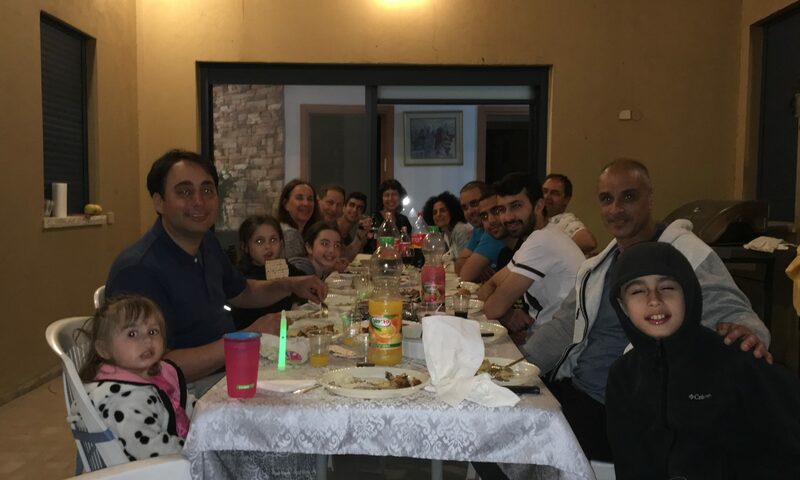 And now we always get together when I come to Israel. Not only do I love the beauty and serenity of the desert, but I also adore the magnificence and lush landscape of the Galilee. With fertile valleys surrounded by mountains, how could you not love Northern Israel? 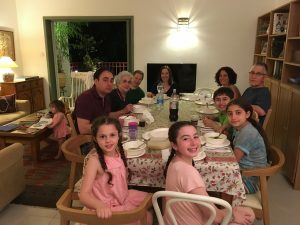 And since this contingent of my extended family lives in a small community in the Galilee, I always get the opportunity to go there. 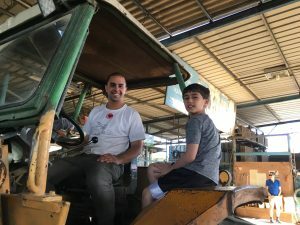 My extended family lives on a Moshav. 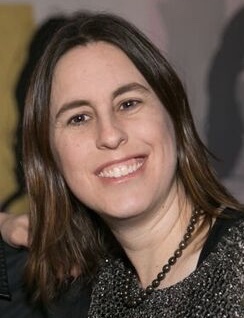 There is no direct English translation for this term as this kind of community is very unique to Israel. It’s a cooperative agricultural community. Everyone owns their own home and property and for the most part have careers and commute to a job every day. But at its heart it is still a tight cooperative farm. 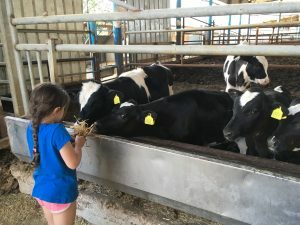 We love to spend the day with our cousins, at their home, walking around the Moshav and touring the dairy cows on the farm. The kids went on a tractor ride and fed a few cows, some born just a few days ago. Matthew even asked if he could take one home. Our trip is not over yet, and when it is we will have a solid 12 hours of flying ahead, to get back to Toronto. We still have a few more days to soak up with our extended family, and we relish every moment. It’s a long, 12-hour flight to “Montreal,” but it’s so worth it. Today is March 5, 2018. It’s my son’s eleventh birthday today. For the past few days I have been thinking about what I wanted to write on this day. 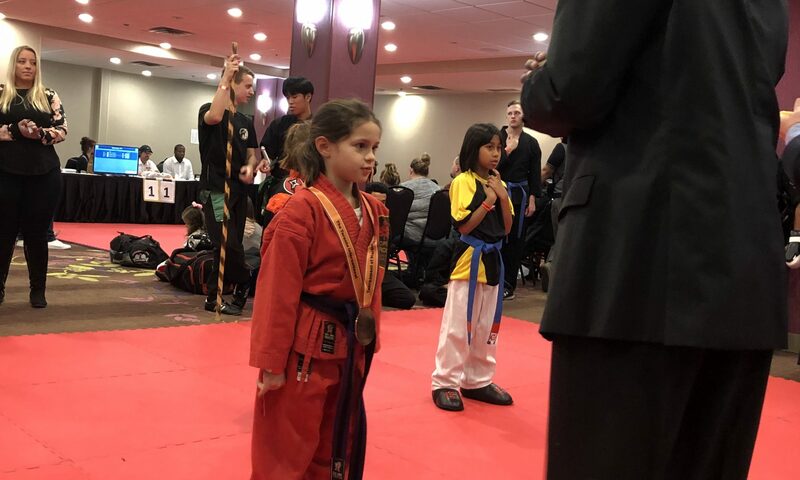 I’m a proud mother, and like all mothers across the world I love to boast about how great my child is. If you have met Matthew (or read my blog! ), you know he’s a great kid. So, I’m not going to write about Matthew today. I’m going to write about cake. 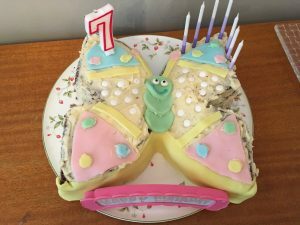 Writing about cake on my eldest child’s birthday makes a lot of sense if you know a little bit about me. First of all, Matthew’s nickname, that I gave him when he was a baby, is Cake. He loved a particular patty cake book, so I of course changed the words to Matty Cake. And it stuck. Or at least for me it did. I still call him Cake. I can’t help it. But that’s not the only reason that I’m writing about cake today. I love to bake. I’m not a professional and I often skim over recipes and do my own thing. My baking works out, most of the time. And each year, on each of my children’s birthdays from age one and on, I bake a cake. And we’re not talking about just any old chocolate or vanilla slab number with icing. I’m talking about an elaborate theme, with designs, cut-outs, colours and shapes. I will admit that the finished product usually tastes better than it looks. Again, I am really not a professional. I would barely even call myself an amateur. I guess I’m just passionate. Fun. Creative. And definitely a bit crazy. 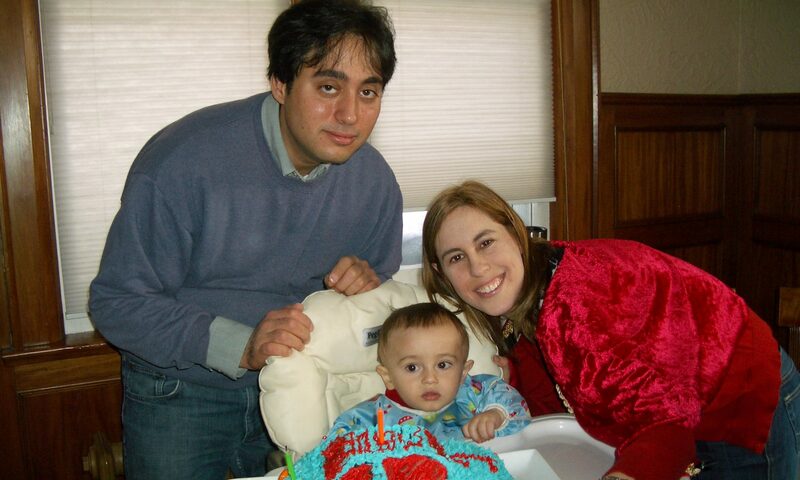 My first adventure into crazy cakes was on Matthew’s first birthday, back in 2008. I had a son. He loved everything boy. So, I made him a car cake. By age two he was obsessed with Thomas the Tank Engine. 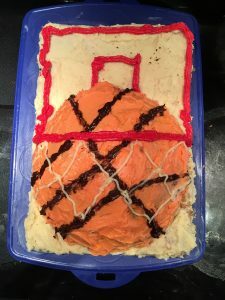 My husband challenged me that he could bake a better cake. 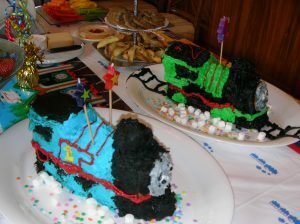 He baked Thomas and I baked Percy. Mine was better. Much better. I made Percy and David make Thomas. Percy tasted better. 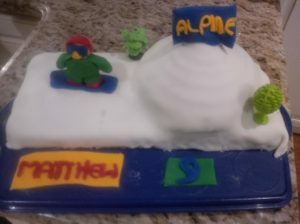 As Matthew has grown up I have made a spaceship cake, a volcano, snowboarder on a. mountain and last year it was a basketball net. Some cakes have gone according to plan and others, well, not so much. 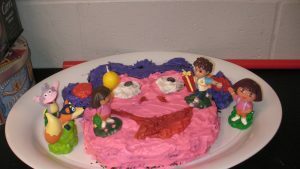 His Boots cake when he turned three (yep, from Dora the Explorer) looked a bit funky, but the kids liked it! 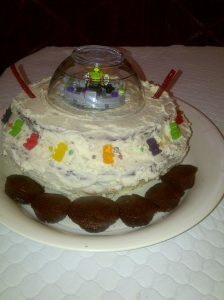 He asked for a flying saucer and that what’s I did in my own special way. It was his first year of snowboarding so I had to do it. I didn’t slow down when Julia came along. 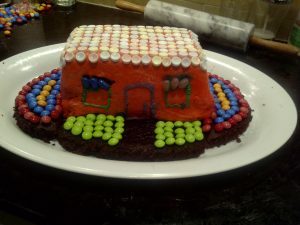 I did the tea party theme when she turned one and made a dollhouse when she turned two. During the Frozen craze, I put together Elsa’s castle. Last year she asked for a butterfly. And of course, I came through. 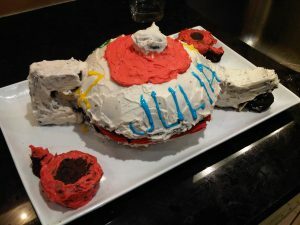 I tried to make a teapot when Julia turned one. 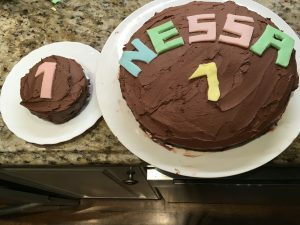 For Nessa’s first birthday last year I will admit I was a bit boring with a simple, though multi-layered, circular chocolate cake. But I cut out nice letters and made a special mini one for her to smush into her face. One for us and one just for Nessa on the day she turned one. Matthew asked for cupcakes this year and no big elaborate cake. I was a bit disappointed, but I dove into my cupcake making this weekend. 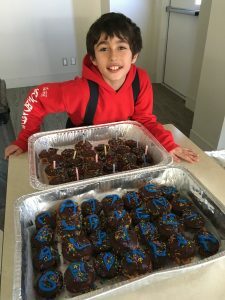 I produced 60 cupcakes, half white and half chocolate, with icing, sprinkles and a blue icing birthday message. He enjoyed them with his snowboard team and was quite satisfied with my effort. 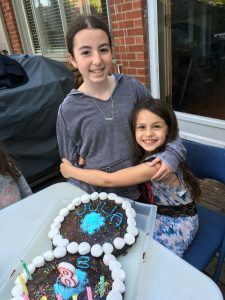 Julia is still asking for an original and creative cake for her birthday in a couple of months, and I have years to go with Nessa. No matter how crazy the idea is, I’m up for it. Sometimes, the crazier the better. So, a big happy birthday to Matthew. When he was born, he was the original inspiration for this blog. It only took me ten years to actually do it, and I don’t regret it at all. His love of sports, travel and all things intellectual continue to inspire me every day. 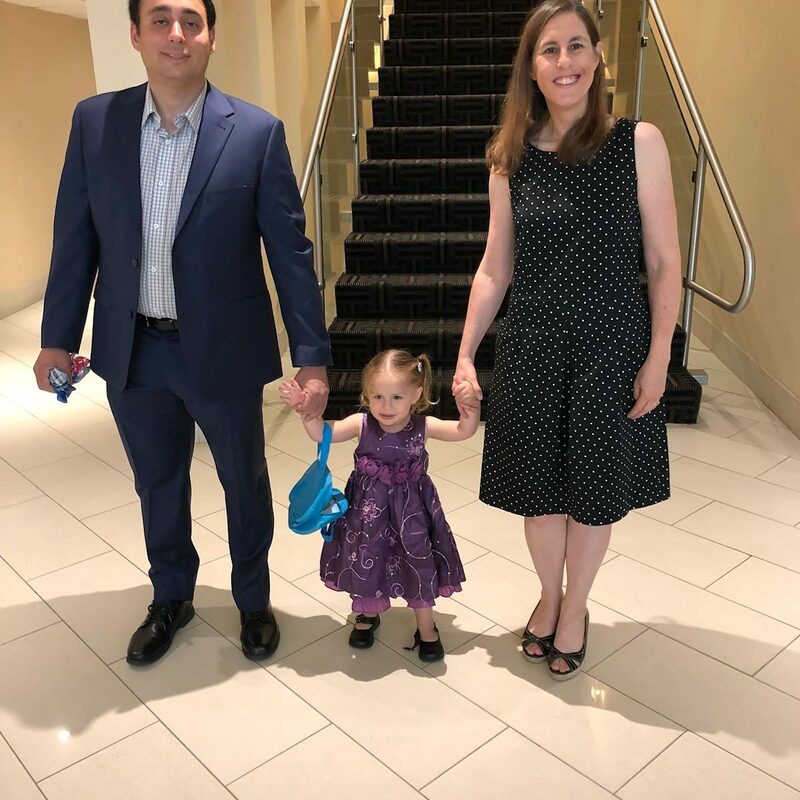 It has been a busy week, for me, my family and the world around me in general. 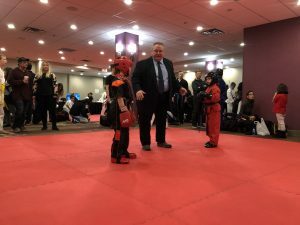 As I wrote last year, when I first created this blog, life is busy. I always seem to be in motion, trying to balance the many demands in my life. Here is a place that I can think, reflect, discuss, debate, and just write. 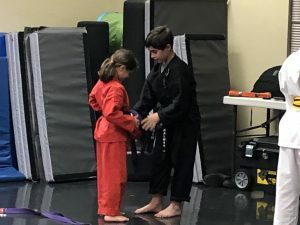 When I feel like I am so busy that I don’t have time for this blog, I remind myself that I have to make time for this new passion of mine. I feel lucky every day that I found this avenue to share my thoughts. So, share my thoughts is what I will do today. 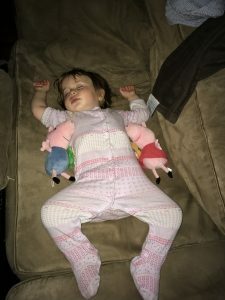 Not deep thoughts, just some musings about the sleeping habits of the people in my household and the bed hopping that happens every night. 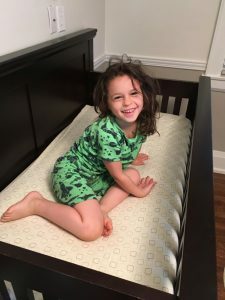 When my first child was born, over ten years ago, I went to great pains to find the perfect crib. It had to be safe yet stylish. It had to be functional and a bit fab. The baby furniture was delivered and set up just in time for baby Matthew to arrive home from the hospital. I carefully placed my three-day-old son into his new crib, and he screamed. He hated it. 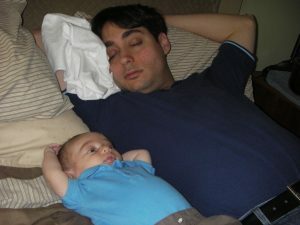 My newborn knew what he liked: my bed. 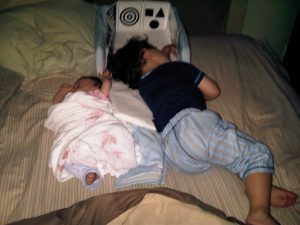 I am not going to debate the merits of co-sleeping, sleep training, cribs or beds. 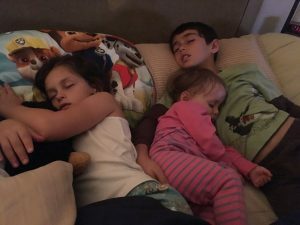 I just know what I know – and I know that all three of my children preferred, from the first day of their lives, through today, to cuddle up tight with me, in my bed. Whether it’s good for them (or me!) or not, is not the issue. They like my bed, or someone else’s bed. But not their own, and especially not a crib. We tried hard to convince baby Matthew to like his crib. By eleven months old he would stand and lean on the railing and scream. I will admit that part of my brilliant child’s challenge was that he could stand but couldn’t figure out how to sit down. But I knew he wanted out. Even with his cousin, Matthew hated to go near his crib. Julia was a bit smarter, and when she was fifteen months old she figured out how to climb up the crib’s railing and jump out. She was a bit of an escape artist and was pleased that she figured out how to get out of the crib and high tail it to my bed. Julia was a bed-hopper from a very young age. Newborn Julia quickly discovered where she wanted to sleep. 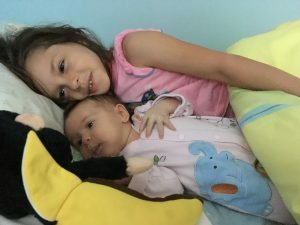 Julia discovered the joys of a crib at age 6, when Nessa was born. Nessa is my strong-minded and yet also lazy and stubborn baby. I feel like she knew how to say no days after she was born. 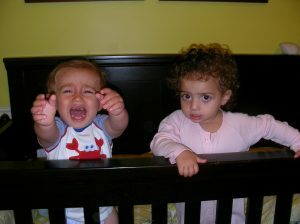 She was determined to hate her crib, the same one that her brother and sister used, from the first time she saw it. Just say the word crib near Nessa and she shakes her head no. Nessa knows what she wants: my bed. They all want my bed, or maybe any bed that’s not their own. 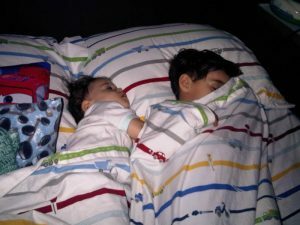 Bed-hopping each night is an art in my house. Rarely do any of us wake up in the morning in the same bed we started in the night before. Every combination of people moves around and settles in beds around our house every day. 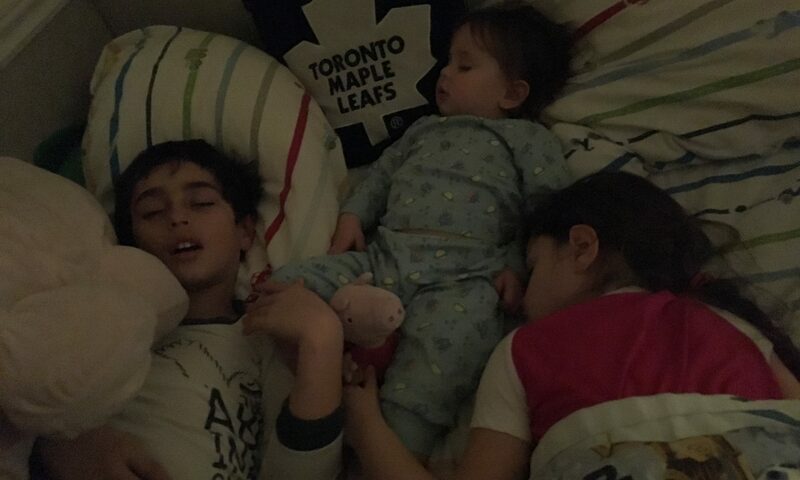 I am thankful that my children love each other and like to snuggle up together. 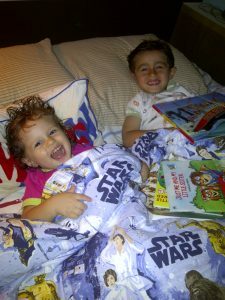 When they refuse to go to bed it’s often easiest to put them into one bed, cuddled up close, and hope that they put each other to sleep. It usually works. 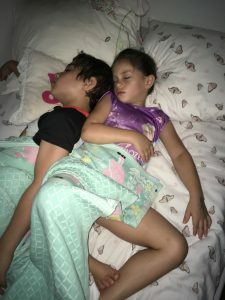 They wander around the house and find other beds as the night wears on, but I think they enjoy their time together in one bed. As I write this, it’s late on Wednesday night and everyone is asleep in my house. Nessa is passed out in Matthew’s bed, which she took over as her own (she won’t even look at her crib). Matthew is asleep in my bed, with some sporting event blaring on the TV. Julia is actually asleep in her own bed, but that won’t last long. In a few hours, they will all travel to a different location around the house. Sometimes my house is like Union Station in the middle of the night, but I wouldn’t have it any other way. She’s everywhere. And I mean everywhere. If Nessa is awake, then she is on the move. 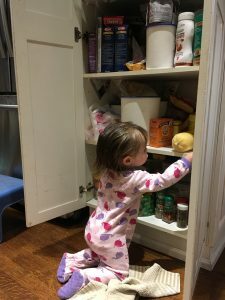 I know that toddlers are active and curious little beings. I’ve had three of them. But wow, this toddler takes the cake. 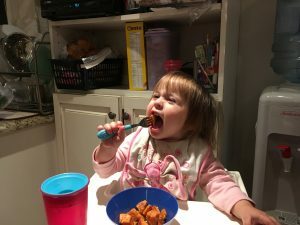 Is it a third child thing to be a toddler menace? I am a middle child, so it’s easy for me to say this. 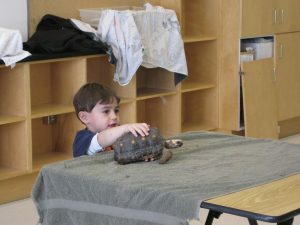 My other two children were definitely active and curious toddlers. I remember when Matthew was an infant we bought all kinds of baby proofing equipment for the kitchen, bathrooms and electrical outlets. We set up a baby gate at the top of the stairs and were ready for anything. We never used any of it. He wasn’t interested. If I gave Matthew a couple of pots and a spoon in the kitchen, that kept him busy. If I put him in his bedroom to play, he sat with his toys and books and basically just stayed there. 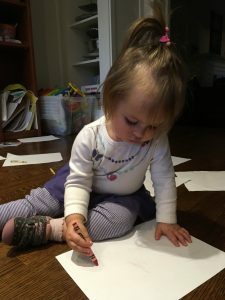 Julia kicked it up a notch and was a more calculating, curious toddler. She was not a menace, but she quietly hid precious items in unfindable places and giggled in a sly way when she knew she did something wrong. She still does. But Nessa is a menace to society. And she doesn’t even walk yet! My adorable and quite loveable third child travels around on her bum. I call it “bum walking.” It takes quite a bit of talent and strong abs to move around at the speed that she does. She was quite the lump of a baby for the longest time and wasn’t interested in moving at all. When she started to scoot around, slowly, on her bum, we were amused. Nothing stays on her feet for long. 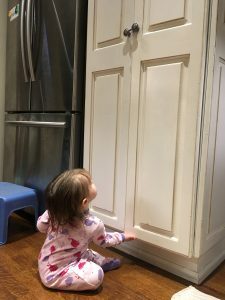 Over the following months, Nessa perfected the art of bum walking, and now that she has combined that with standing and climbing, she can move around quickly and grab anything she wants. Kitchen utensils drawer: deftly opens it and takes out tongs, serving spoons and whisks. She particularly likes to open the oven warming drawer as well and drop her treasure in. 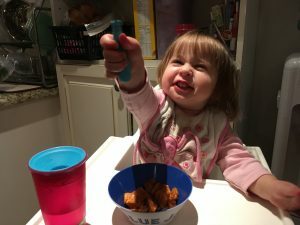 The water cooler: she figured out that if she pushes on the blue or white buttons that water comes out. Fun! 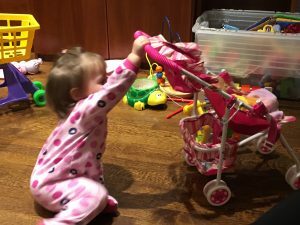 Diaper bag: whether it’s open or not, if she can reach it, she opens it and empties it. 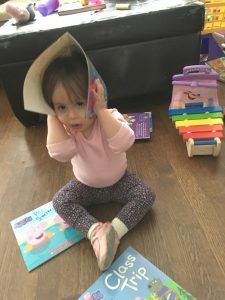 Bookshelf: Nessa loves her books and it’s adorable to watch her “read.” It’s not as much fun when she feels the need to read every book on her shelf out all at the same time. Cables: in particular iPhone cables. Nessa likes to chew on them. Yes, I know, that’s a problem. If the doors are open, she dives in. 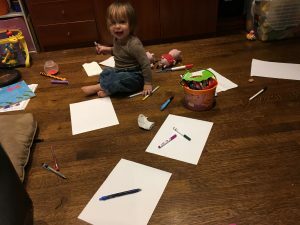 Creating one of her early masterpieces – after she dumped the crayons and a stack of paper on the floor. The list goes on and on. It’s hard to get angry with her because she is just so cute. 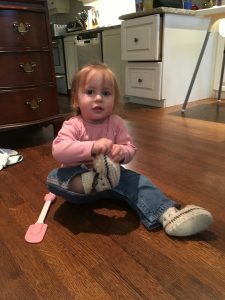 Oh, and she often sings to herself as she scoots around the house, looking for the next place to cause trouble. Could you get angry with this face? 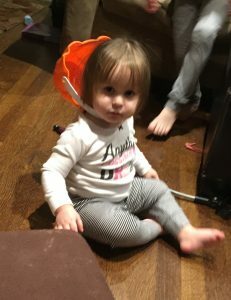 Maybe Nessa is just really intelligent, way beyond her years (or months, she is only a one-year-old). 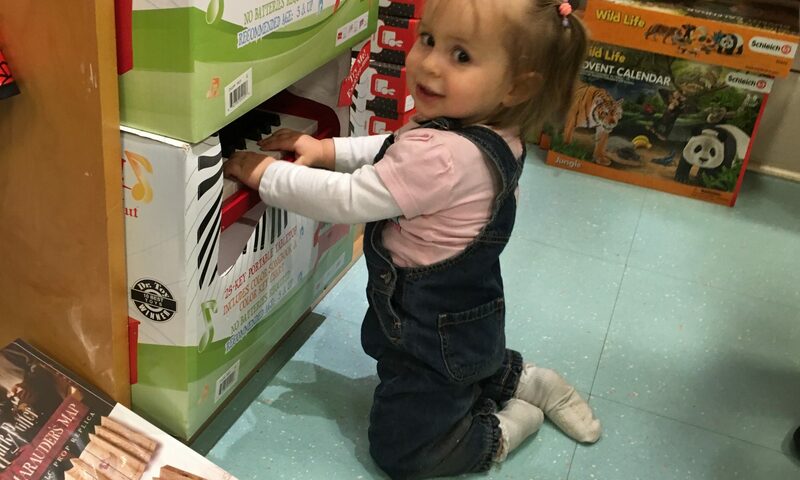 Could it be that her tremendous curiosity is a sign of her need to explore the world and soak it all up before she turns two? Or is she just a menace? Cute and cuddly, but one little troublemaker. 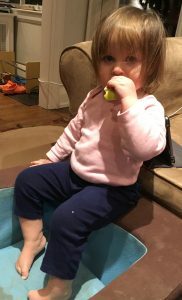 I would love to hear stories about other toddler menaces. Were you one? Do you or did you have a child in this category? Am I right about the third child? Leave me a comment here, post your thoughts on Facebook or Tweet me @AliciaRichler. The only time she stops moving. I have seen dozens of posts on Facebook, Twitter and Instagram the last few days that have featured groups of people standing in front of a lit nine-branch menorah, wishing me a Happy Chanukah. Those are all nice photos, as we celebrate our festival of lights. But for me, it’s the festival of oil. Or fried oil to be more exact. Okay, for me it’s all about my latkes. I don’t often boast like this, but I think I make the best latkes. For those of you who don’t know what latkes are (first of all, shame on you), I will briefly explain. The essence of the latke is the story of the great miracle that is at the heart of the story of Chanukah. 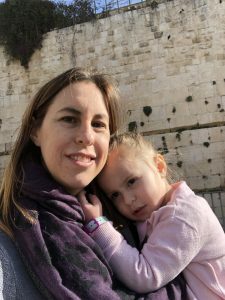 The quick version goes back over 2,100 years ago, when a small but brave group of Jews living in Jerusalem, led by the Maccabees, defeated the Syrian forces, led by King Antiochus IV. As they cleaned up their desecrated temple, the Jews found only enough oil to light the lamps for one night. But a great miracle happened, and the oil lasted for 8 nights! So, while there is much to celebrate during the holiday of Chanukah, we always remember the oil. And what better way to celebrate oil then to heat a ton of it up in a fry pan and cook some delectable food? 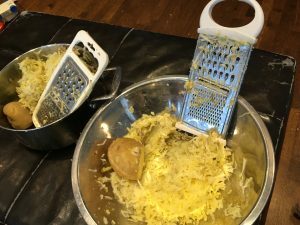 Take a potato, shred it (with a hand shredder of course), mix in eggs, onion, a bit of flour, baking powder, salt and pepper, and you have the ingredients of a latke. Or in my case, 17 potatoes, and you get 95 latkes. I take latke-making very seriously, and a big reason for why mine are so good is that I have the spirit and strength of my grandmothers with me as I cook. First of all, I wear my Nanny’s apron. It’s not gorgeous, but it protects me from oil splatters and keeps me relatively clean. Second, I use my Bubby’s electric fry pan, which is definitely older than I am. Maybe it’s built-in grime from decades ago is what makes my latkes extra tasty. 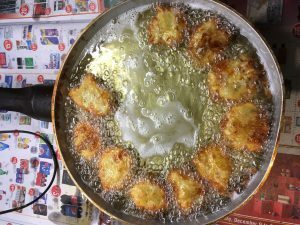 I jumped into my annual latke-making on Tuesday night, the first night of Chanukah. With my range hood fan set to high and electric fry pan powered up, I got to work. 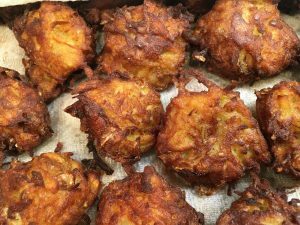 My parents, uncle, children and husband were on hand to test and taste, and we ate through a few dozen latkes in no time. Yesterday I brought in a bunch of latkes from the Tuesday night batch to work. I enjoyed watching my colleagues dive in. 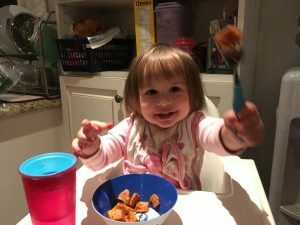 For one person, it was her first ever latke. She timidly asked me, with her latke on her plate, what exactly is a latke, and I proudly explained. Then she tasted it and was hooked. I really felt like a proud mother at that moment, when I saw my colleague enjoy her first latke. It made my day. So, you ask, what makes MY latke so good? Well, I think it’s many things. 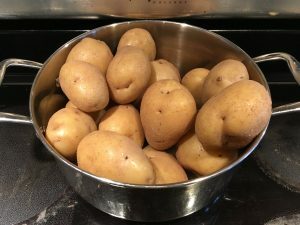 Good, quality potatoes (I like Yukon Gold), parboil the potatoes and hand shred them. Gently mix the batter of course. Piping hot oil in my Bubby’s electric fry pan of course. And I form my potato mixture into a slightly flattened ball. 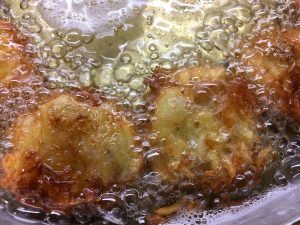 I immerse the latkes in hot oil just long enough so that they are golden brown and crispy on the outside but perfectly soft on the inside. 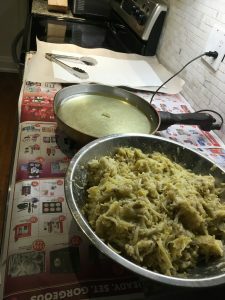 The shredded potato mixture is ready to jump into the fry pan – note newspaper set up to protect my countertops from the flying grease. Don’t the latkes look happy in there? Look at that bubbling oil. Scrumptious. Is your mouth watering now? Are you craving a hot, greasy, crispy one right now? I’d share a few more from my batch, but I only have a few left. We can’t stop eating them! 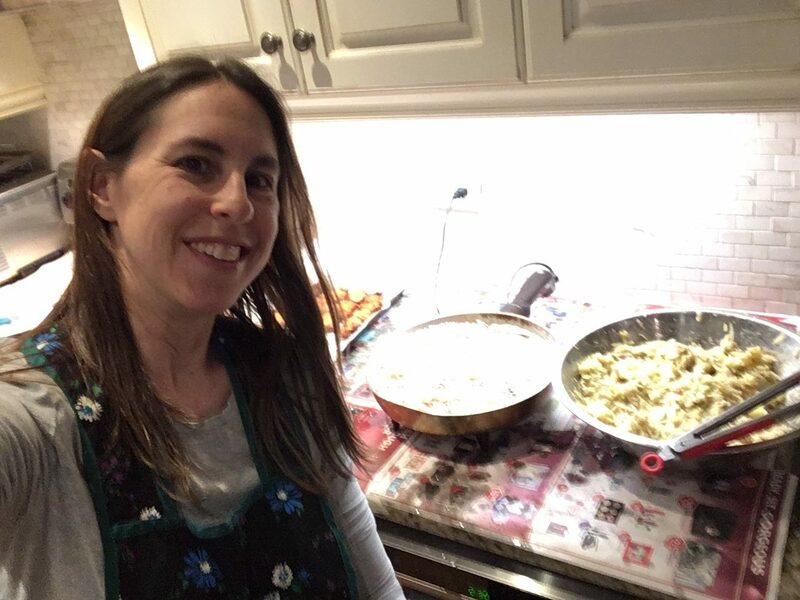 And while I admit that I was more focused on my latkes than my family on Tuesday night, and took many more photos of my kitchen than my children, I did snap a family selfie last night, on the second night of the holiday. What would Chanukah be without a photo of children and a lit Chanukiah? 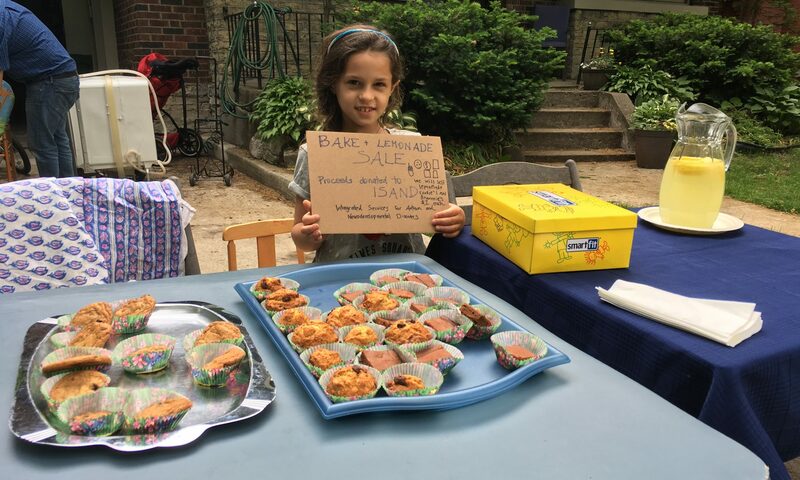 And latkes of course! 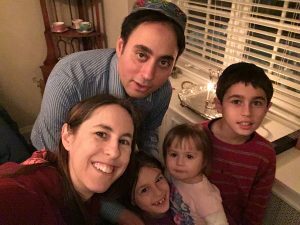 Yes our token sweet family with the lit Chanukah photo. We had to do it.